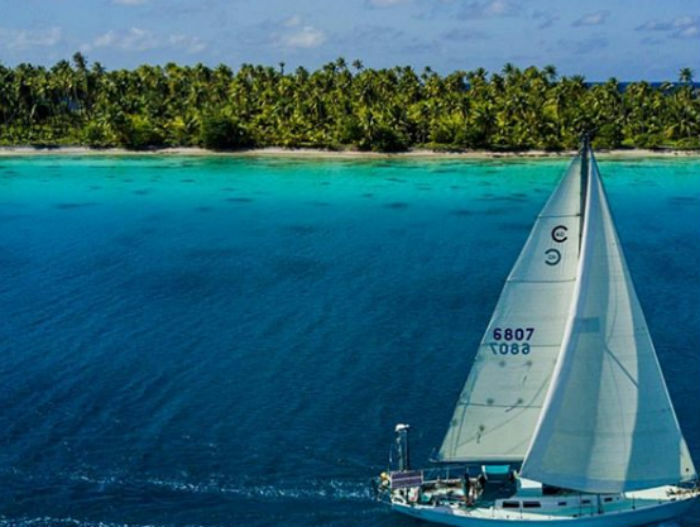 For most of us, the idea of life on the open seas sounds a little too daunting. To Liz Clark, it’s just her life. 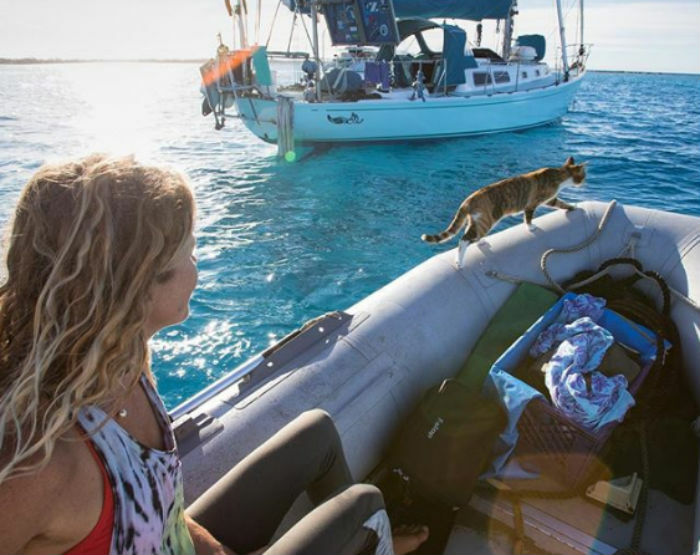 San Diego born Liz gave up everything to sail around the world on her 40-foot-sailing boat, Swell, alongside her cat, Amelia. 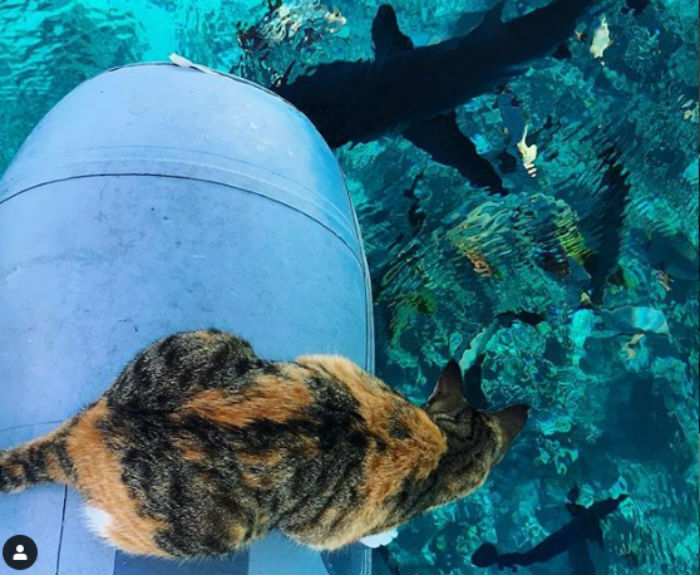 Liz’s adventures with her feline first mate haven’t gone unnoticed, with over 100,000 followers keeping up with their journey on Instagram. Join us as we take a look at the fabulous life of Liz and Amelia on the open seas. From what inspired the sailor to what they love most about their nomadic lifestyle — this is a story you don’t want to miss. Life on the water doesn’t always feel like a vacation. Liz Clark was born and raised in San Diego, California. 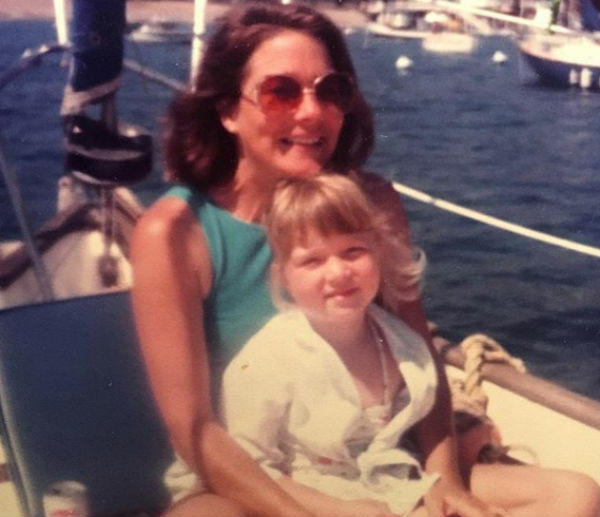 At the age of seven, she learned to sail on a simple red sailing dinghy – miles away from the boat she would eventually call her home. 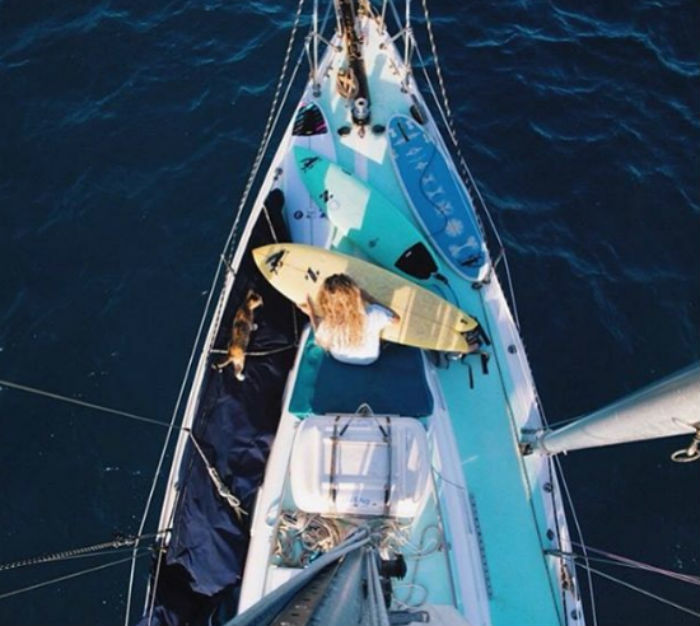 After completing a 5,000-mile six-month cruise in Mexico with her family on their sailboat, The Endless Summer, Liz knew that the beauty and freedom of sea travel was something she would love forever. At just 10 years old, the trip opened up her mind to the environment outside of what she usually saw in the city. From that day on, Liz knew she wanted to help protect the environment in any way she could. Fast forward five years and 15-year-old Liz decided to try surfing. She had an instant connection with the water sport. “It was all I wanted to do,” she would later confess. After a while, Liz started competing professionally, going on to win at the NSSA Nationals in 2002, making her the College Women’s National Champion. 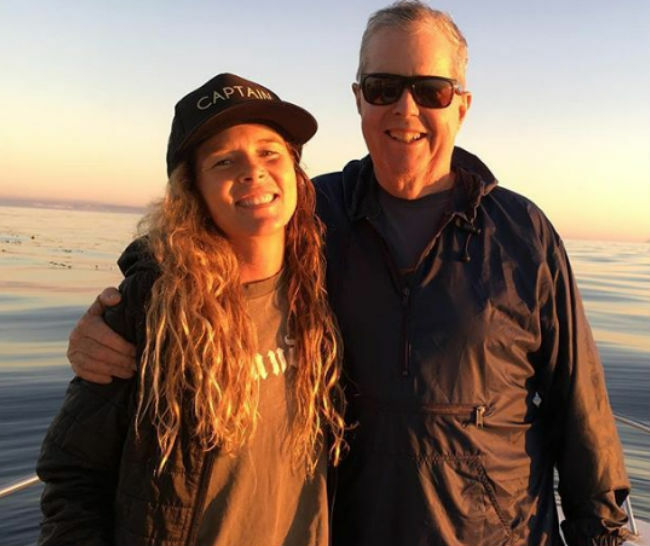 Liz was busy studying Environmental Studies at Santa Barbara, and while she loved surfing, she decided to concentrate on her connection with different countries and what she could do to help preserve the planet. “I remember feeling frustrated by the direction the world seemed headed,” reads her website. 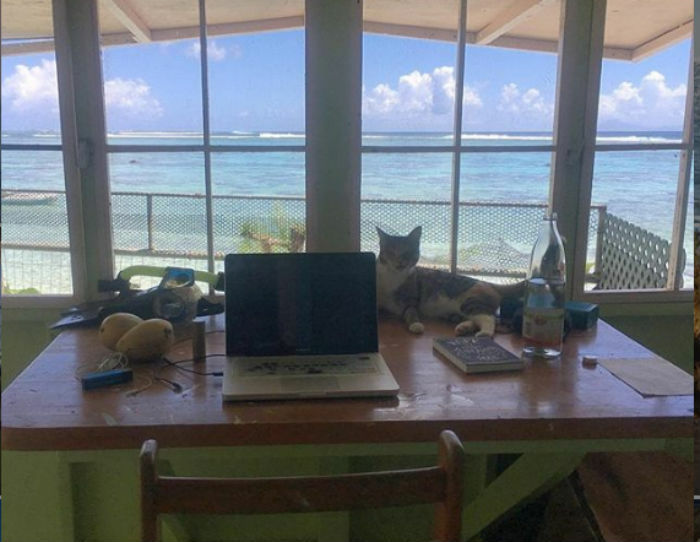 After spending a lot of time during summer breaks travelling the world, Liz decided to seek out jobs on different boats after her graduation. 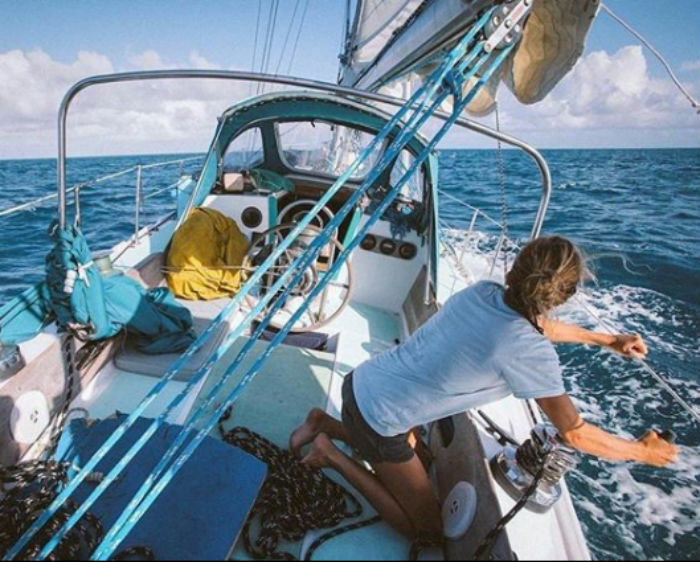 After a year building her experience, Liz came across the sailboat that would become her home, Swell. With the help of her friends and family, she was able to buy the Cal-40 and transform her into a liveable, loveable vessel that would safely transport her around the world – but it took a lot of doing. It would be a little while before Swell and Liz would be able to take on the world together, but the wait would be worth it. The Cal-40 design dates back to the 1960s, with the first vessel launched in 1963, created by marine architect Bi Lapworth. It soon became clear that this revolutionary boat with its flat-bottomed design was going to change the racing scene for good. 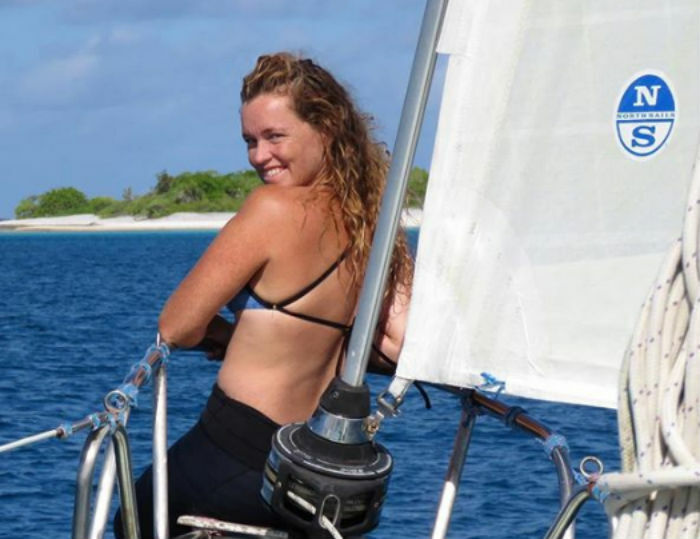 “Her sails were in good condition, but Swell needed a great deal of work to be converted into an open ocean cruiser,” said Liz of the sailboat. Two years later and the former surfer had overhauled Swell, while simultaneously learning the ins and outs of safety, rigging, and sail repair on the move. Liz was almost ready to go, but something was missing. While Liz was looking forward to her adventures on the high seas, she also realized that she would need a companion. In no time at all, she adopted a six-month-old kitten, Amelia, from a rescue in San Diego. Ready to leave the land behind and make the open ocean their new home, the pair climbed aboard Swell and pointed the stern away from San Diego harbor. They weren’t sure where they were going, but with a map and the ability to navigate, the pair were in for the adventure of a lifetime. Their adventure wouldn’t go unnoticed by the world at large. For the most part, Liz’s life on the waves looks like a pretty tranquil affair, but in reality, it’s a feat that not many people could manage. In her autobiography, Swell, Liz talks about some of the rough parts of her 12 years on the water. There’s a time when she almost got struck by lightning, the time when she contracted a rare fungal infection that needed almost immediate medical attention, and on top of all that, things go wrong with boats quite frequently. Liz had to navigate alone, fish alone, sleep alone and most of all, stay safe alone. Amelia settled into her life on the water pretty well, although Liz explains that “she knows her limits.” Her Instagram page is full of pictures of the gorgeous feline sitting on the edge of the boat as they sail, but Amelia has one favorite activity that trumps the rest. If she’s not looking out at the open ocean, then she can be found sitting on a float that’s tied to the back of Swell. This is the perfect place for her to catch some fish out of the water. It might be an unconventional life for a cat, but it’s a pretty good one. You would think that a person leaving their life on land to sail the world would have to be a really experienced sailor…right? In Liz’s case, she was far from a pro. Twelve years is a long time to spend at sea, and while Liz had some friends join her for visits on certain occasions, the majority of the time it was just her and Amelia. During the rough times where she would be caught up in storms, Liz admitted to feeling scared, and often alone. It wasn’t until the end of the journey when she entered into a relationship that Liz felt as though sailing was much safer and easier. “During the tough times, I was just like, ‘Can I be anywhere but here right now? Please teleport me! '” she would later say. When Liz started documenting her journey on Instagram and social media, her following grew quite quickly. People were taken with both her honest approach to the world around her and her relationship with Amelia. 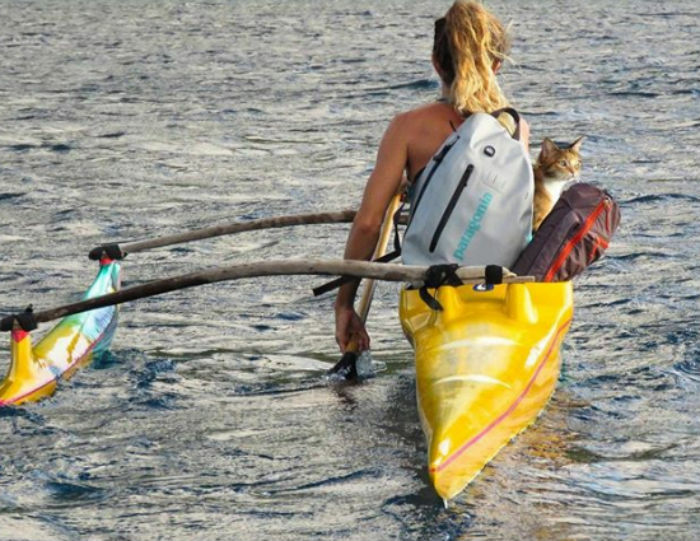 After all, it’s not every day you see a sailing cat. It didn’t take long for publishers to come knocking, and Liz soon landed a book deal. Her honest description of her adventures, coupled with the personal trials and tribulations she encountered on the way, became an award-winning bestseller. It scooped the Gold award in ‘Inspirational Memoir – Female’ in the Living Now Awards. Not bad for a girl and her cat, right? Despite being away from her family frequently, Liz is still incredibly close to them. She often pays tribute to her mom on social media and shared a touching story about her father’s health at the start of 2018. Liz described in an Instagram post that her father was overweight in 2016 and on the verge of a cardiac event. She stopped traveling to spend some time with him, teaching him how to better himself, but when she left, was anxious that he wouldn’t keep it up. Luckily for her, she was wrong. “I couldn’t believe the difference in his appearance and his overall health,” she wrote. Although she doesn’t hold down a 9 to 5, Liz does what she can to get the message of sustainability out there. She often posts about the importance of making better choices to help the planet on her social media. 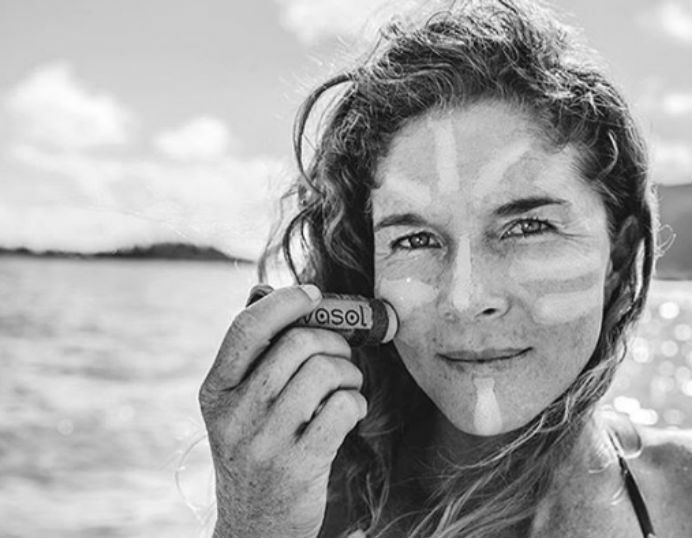 She has previously partnered with Avasol sunscreen to promote their plastic-free products that use recycled cardboard, reducing plastic packaging by 90 percent. With the focus on what goes into our oceans at an all-time high, Liz uses her platform to try and make a difference. It’s not all gorgeous pictures and fluffy kittens (although there’s a lot of that going on too). Quitting the 9 to 5 rat race is a huge step, but it isn’t always as glamorous as it seems. You’ve suddenly got no reliable source of income and in Liz’s case, you’ve got a boat to maintain. However, there’s also plenty of time for what most of us put on the back burner – self-care. Liz is an avid yoga fan and spends a lot of time on the boat getting her namaste on, as well as sunbathing in some of the most beautiful locations in the world. From Panama to the Pacific Coast, there’s nowhere she hasn’t been. 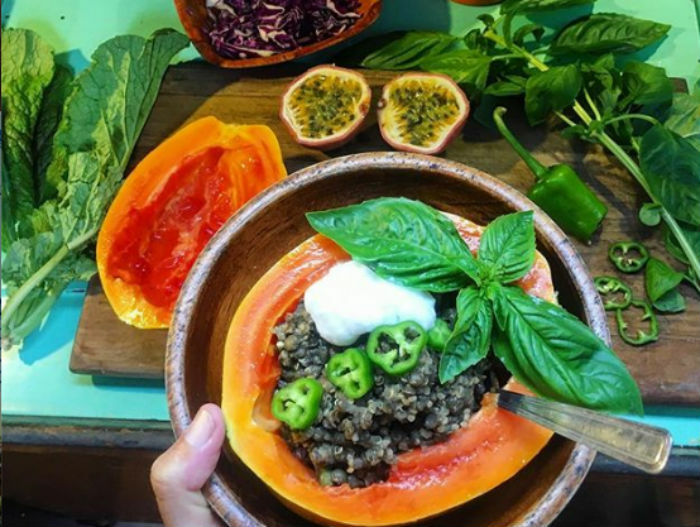 Vegans often choose to eat a plant-based diet because of the health benefits, but in Liz’s case, she’s in it for the environmental impact. Her social media feed is littered with posts about how not eating animals or their products is beneficial to the environment, with #endanimalslavery. You would think that living on a boat for 12 years would require some fishing, but Liz simply made sure she had enough provisions to last her until her next port. By championing the cause, she hopes that others will be inspired to try it too, like her own father who made the change a couple of years ago. 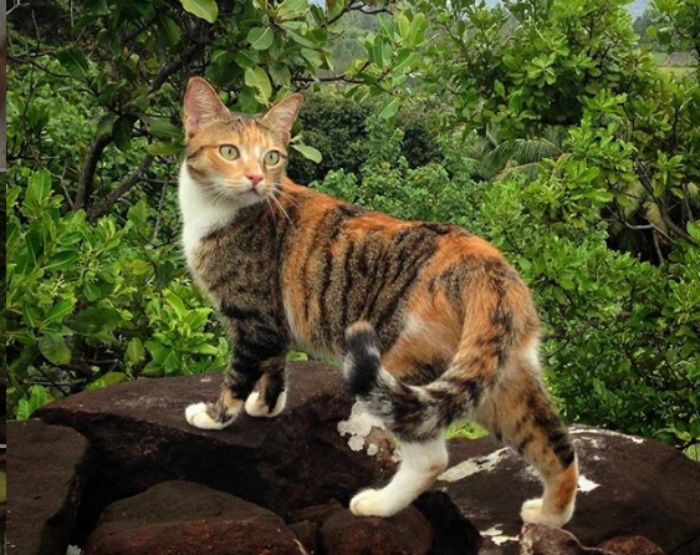 Walking a cat is pretty difficult, that’s why the majority of feline owners don’t do it. Cats are notoriously hard to control, they’ll just do what they want. Amelia, on the other hand, has learned how to roam free next to Liz. 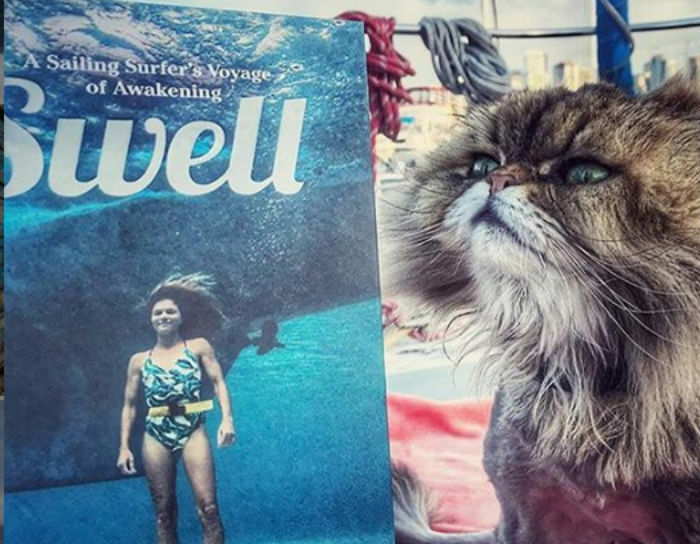 After spending such a long time on the boat, Liz spent the majority of last year on the book tour for Swell. Talking to Surfer, she expressed a desire to set up home on land. Considering that most cats are scared of any body of water and hate the feel of it on their skin, Amelia does pretty damn well. She stalks along the side of Swell, gets right up on the stern of the rubber dinghy and fishes from the back of the boat. 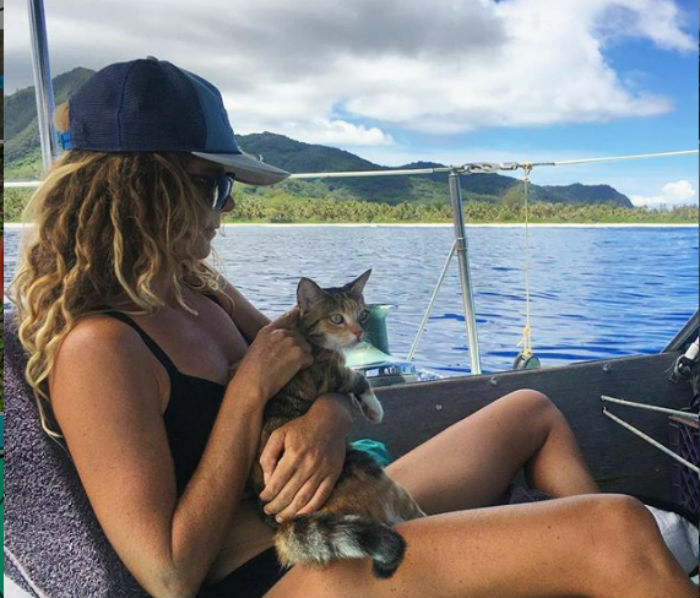 On the occasions Liz canoes from Swell to shore, Amelia also hops on board the super-small vessel with her cat mama and sits still while they travel across the ocean. Seriously, is there any limit to what Amelia can do? Our cats are scared of the vacuum, let alone the Pacific. 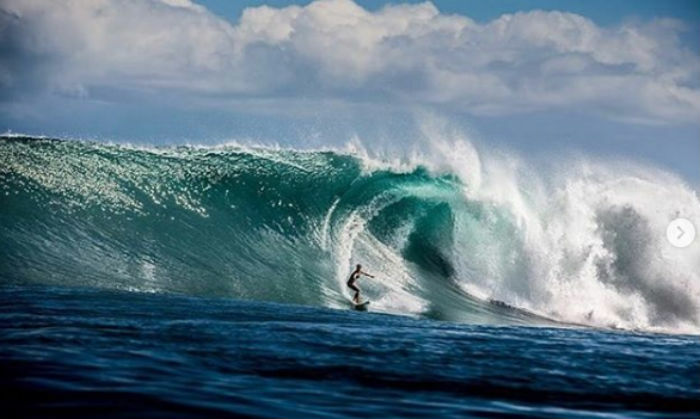 Liz loves surfing and hits up the waves in some of the best, most remote places in the world. However, surfing away from large crowds and populated beaches also comes at a risk. The sailor has previously stated that you have to be super aware of your surroundings when out there on your own, as there’s no one around to call for medical help if you need it. Luckily, she’s managed to avoid any serious injuries but she still has the odd accident. In July of 2017, she had a nasty encounter with a reef that left her quite battered and bruised. Although Liz spends a lot of time by herself out on the ocean, she loves it when her friends come to visit. 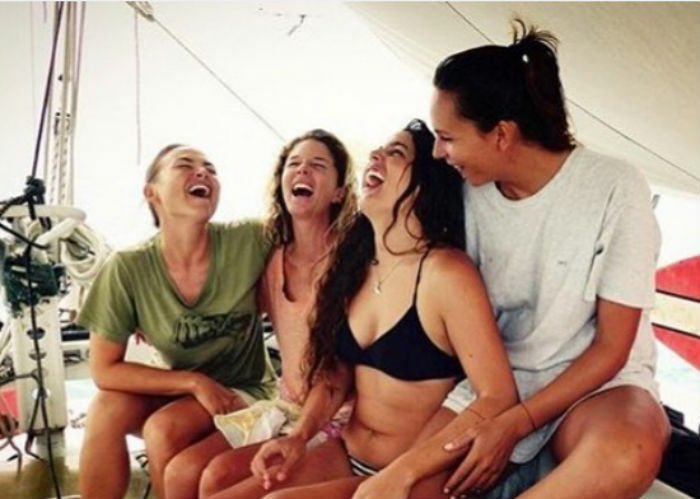 In a heartfelt Instagram post, she paid tribute to them for Women’s Day. 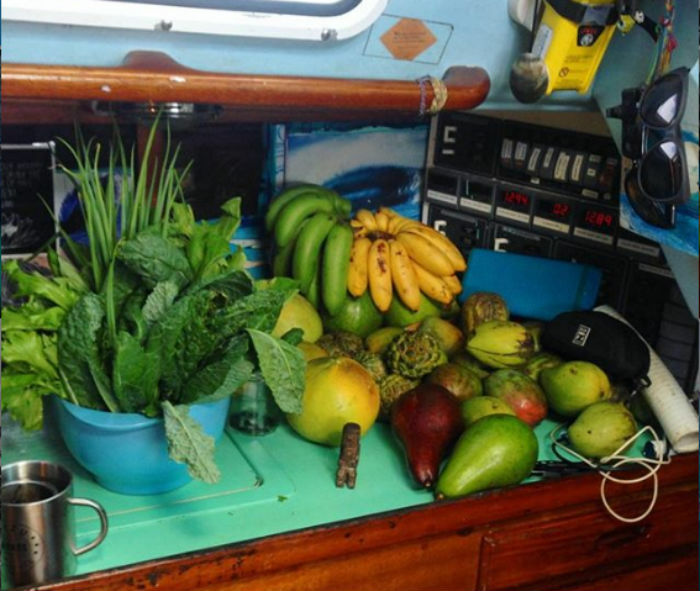 Instead of going to big grocery stores on the islands that she lands on, Liz makes a point of buying local produce from farmers that keep her going.